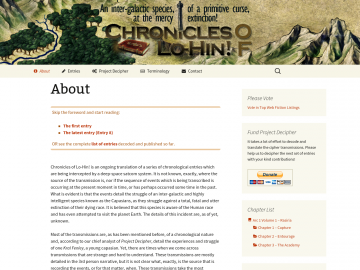 Muse's Success » Web Fiction Listings » Chronicles of Lo-Hin! "An inter-galactic species at the mercy of a primitive curse, extinction!" Chronicles of Lo-Hin! is an ongoing translation of a series of chronological entries which are being intercepted by a deep-space satcom system. It is not known, exactly, where the source of the transmission is, nor if the sequence of events which is being transcribed is occurring at the present moment in time, or has perhaps occurred some time in the past. What is evident is that the events detail the struggle of an inter-galactic and highly intelligent species known as the Capasians, as they struggle against a total, fatal and utter extinction of their dying race. It is believed that this species is aware of the Human race and has even attempted to visit the planet Earth. The details of this incident are, as of yet, unknown. Chronicles of Lo-Hin! has not been tagged yet. Help others find Chronicles of Lo-Hin! by tagging it! Chronicles of Lo-Hin! has not been reviewed yet. Chronicles of Lo-Hin! has not been recommended yet.